Daddy and I were Handfasted together on May 3, 2015 in Napa, California. The Pagan Rite of Handfasting is the Pagan ritual of Spiritual Marriage. It can also be a “Trial Spiritual Marriage” (aka a Spiritual Engagement) for the term of one year and one day. Up to 13 Ribbons are wrapped around the pair’s wrists and forearms in order to represent the permanence of the bonds between them. Each ribbon represents a blessing bestowed upon the couple during their union. If the Handfasting represents Marriage, the ties are sacred and permanent. If the Handfasting represents an Engagement, after a year and a day, the participants decided if their love is sustainable. If it is, the relationship continues and (hopefully) progresses. If it is not, the ties are cut, both literally and symbolically, and the two part ways. Daddy and I entered into a Spiritual Engagement. Our ultimate goal was to be together permanently by the time our engagement period was complete. We celebrated the continuation of our lives in relationship two months after He moved in. This is the Pagan Rite of Handfasting Ceremony which I researched and wrote myself just for that special day. Our chosen Sister, Sarah, read the Ceremonial Rite as The High Priestess. Our Chosen Family, Nicole and Tony, read and acted as witnesses before The Goddess of The Moon, that evening, when the Moon was Full. High Priestess: Let it be known that the circle is about to be cast. All who enter can only do so in perfect love and perfect trust. High Priestess: Guardians of The Watchtowers of The East, we call upon you to watch over this Rite of Handfasting. Powers of knowledge and wisdom, guided by Air, we ask you to watch over us tonight in this circle. Let all who enter the circle do so in perfect love and perfect trust. High Priestess: Guardians of The Watchtowers of The South, we call upon you to watch over this Rite of Handfasting. Powers of energy and will, guided by Fire, we ask you to watch over us tonight in this circle. Let all who enter the circle do so in perfect love and perfect trust. High Priestess: Guardians of The Watchtowers of The West, we call upon you to watch over this Rite of Handfasting. Powers of passion and emotion, guided by Water, we ask you to watch over us tonight in this circle. Let all who enter the circle do so in perfect love and perfect trust. High Priestess: Guardians of The Watchtowers of The North, we call upon you to watch over this Rite of Handfasting. Powers of endurance and strength, guided by Earth, we ask you to watch over us tonight in this circle. Let all who enter the circle do so in perfect love and perfect trust. High Priestess: How do you enter this circle? All: In perfect love and perfect trust. High Priestess: The circle is now cast. Blessed be. High Priestess: With full awareness, Brian and Amy, know before you go further, that since your lives have crossed here on this plane, you have now formed eternal and sacred bonds. As you seek to enter this new state of commitment, you should strive to live these ideals to which you are giving meaning during this ceremony. High Priestess: With full awareness, know that within this circle, you’re both not only declaring your intent to be Handfasted before your chosen Family, but you also speak that intent to your creative Higher Powers. The promises made here tonight and the ties that are forged greatly strengthen your union. They will cross the years and touch your souls’ growth and devotion to one another. 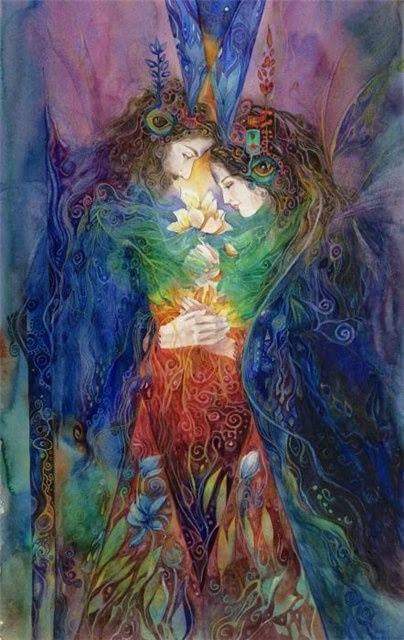 Do you still seek to enter into this Ceremony of Handfasting? High Priestess: The human soul shares all of its characteristics with The Divine. This is the core belief that has caused Man to assign virtues to the Four Cardinal Directions and to align The Guardians of The Watchtowers of the East, South, West and North. It is in keeping with this belief that we align ourselves with the Elements and assign each of their blessings to each of the 13 Handfasting Ribbons. These blessings emphasize the traits that will help you both build a happy and successful union, binding you both together in the bonds of this ritual trial marriage, for a year and a day and as long as love shall last there after. High Priestess: Blessed be this union with the gifts of the East and the Element of Air. The Grey, White and Yellow Ribbons symbolize the blessings of openness, breath, communication of the heart and purification of the body, mind and spirit. From the East, you recieve the gifts of a new beginning with every rising of the Sun and the understanding that each new day is a new opportunity for growth. High Priestess: Blessed be this union with the gifts of the South and the Element of Fire. The Red, Orange and Pink Ribbons symbolize the blessings of energy, passion, creativity and warmth of a loving Home. From the Fire within, you shall generate light, which you will share with one another, even in the darkest of times. High Priestess: Blessed be tissue union with the gifts of the West and the Element of Water. The Blue, Purple and Gold Ribbons symbolize the blessings of your capacity to feel and express emotions. In this Rote of Trial Marriage, you will offer absolute trust to one another and vow to keep your hearts open in times of sorrow as well as times of joy. High Priestess: Blessed be this union with the gifts of the Northland the Element of Earth. The Green, Brown and Silver Ribbons symbolize the sustainability and fertility of the Earth as well as the fertility and security of a loving Home. The Earth will feed and enrich you and help you and help you to build your stable place in this world where you may always return throughout the generations. High Priestess: Blessed be this union with the gifts of our Higher Selves and the Element of the Soul. The Black Ribbon symbolizes your inner drive and personal desire to always strive for strength, success and wisdom. You’ve come together on this night to be bound of your own Free Will, in perfect love and perfect trust, to intensify your visions for the future together as Man and wife. You are expressing your desire to come together as One for all eternity, from this day forward. This vision is solely born of your drive and desire and it is symbolized by the mixing of your Life Forces, carried by your Blood, into all of the other Elements. High Priestess: I bid you both look into each other’s eyes and to remain as such until all of the 13 Handfasting Ribbons have been wrapped around your joined hands. In affirmation of your vows, please respond with “We will”. High Priestess: As you are bound with the Grey Ribbon of the East, will you always strive to remain as balanced and unified as you are on this night, standing in solidarity against all obstacles and foes, allowing your Uniontown cancel out any future divisions set against you, seeking never to break this vow? 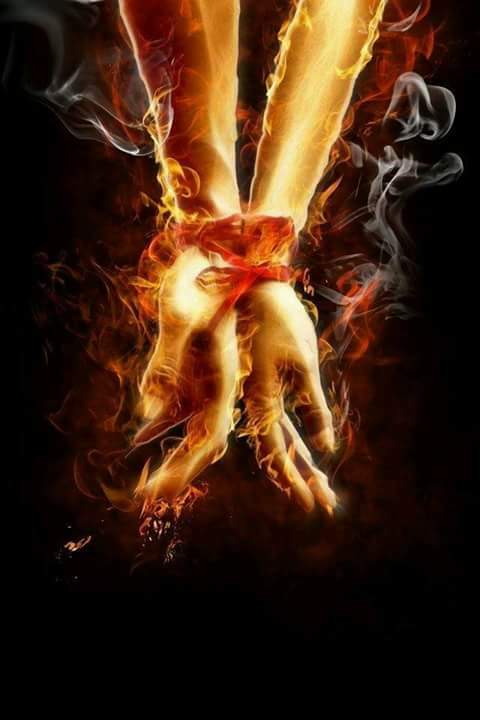 High Priestess: As you are bound with the Red Ribbon of the South, will you always honor and respect one another, ever mindful of the ove, passion and lust that you both share on this night as well as the plans you have to nurture them into a fertile future, seeking never to break this vow? High Priestess: As you are bound with the Blue Ribbon of the West, will you always remain patient and kind in both your words and deeds, speaking always with sincerity and acting always with rationality in the face of all obstacles, seeking never to break this vow? High Priestess: As you are bound with the Brown Ribbon of the North, will you always look upon one another as your shelter from the world and to come together to build your future Home in a deeper intimacy and stability that binds you on this night forward, body, mind and spirit, seeking never to break this vow? High Priestess: As you are bound with the Yellow Ribbon of the East, will you always view your life together in the best possible light, seeking out and appreciating the moments of joy and harmony to balance the moments of sorrow and discord, seeking never to break this vow? High Priestess: As you are bound with the Orange Ribbon of the South, will you always seek to support one another in all your endeavors, as individuals and as a Family, knowing that the Law of Attraction is at this very moment sending you both the bounty that is already yours, seeking never to break this vow? High Priestess: As you are bound with the Purple Ribbon of the West, will you always honor the sanctity of this union, knowing that your balance of power with one another is about humility and responsibility, not arrogance and force as you recognize the sentimentality of these actions as they relate to your Lifestyle, seeking never to break this vow? High Priestess: As you are bound with the Green Ribbon of the North, will you always work together to create a healthy and very prosperous union, based upon the mutual servitude of your Lifestyle as you grow your finances and raise your Family, in full accordance with your shared values,seeking never to break this vow? High Priestess: As you are bound with the White Ribbon of the East, will you always make time for the quiet and still contemplation of the present so you may better focus your intentions on the future, thus creating a very pure, calm and peaceful union, seeking never to break this vow? High Priestess: As you are bound with the Pink Ribbon of the South, will you always strive to maintain the level of honor and romance that you are on this night, as you share in the truth and happiness of this union, seeking never to break this vow? High Priestess: As you are bound with the Gold Ribbon of the West, will you always strive to increase your knowledge base, wealth capacity and energy force through greater spiritual understanding, seeking never to break this vow? High Priestess: As you are bound with the Silver Ribbon of the North, will you always strive to see one another as your most valuable source of inspiration, creativity and ultimate reward in all you day and do,seeking never to break this vow? High Priestess: Asyou are bound with the Black Ribbon of the Higher Self, will you strive to always see yourself as strong and successful, capable and dedicated to the goals for yourselves and your Family, knowing that your visions for the future are as fruitful as you create them, seeking never to break this vow? Amy and Brian, as your hands are now bound together, so your lives and spirits are joined in a union of perfect love and perfect trust. Above you are the stars and below you is the earth. Your love should be a firm foundation from which to grow from this night on. This Cord of Ribbons symbolizes so much. It is your Life, your Love and your Eternal Connection that both of you have found with one another. The Ties of this Handfasting are not formed by these Ribbons nor by the Knots connecting them. They are formed instead by your vows, by your desire, buy your souls and by your two hearts, now bound forever together as One. As the Rite of Handfasting is concluded, we so close tissue circle. High Priestess: Guardians of The Watchtowers of The East, The Lords of Air, we thank you for attending our Rite, as you department to your realm, we bid you farewell (as the Couple extinguishes the White Candle together). High Priestess: Guardians of The Watchtowers of The North, The Lords of Earth, we thank you for attending our Rite, as you department to your realm, we bid you farewell (as the Couple extinguishes the Green Candle together). High Priestess: Guardians of The Watchtowers of The West, The Lords of Water, we thank you for attending our Rite, as you department to your realm, we bid you farewell (as the Couple extinguishes the Blue Candle together). High Priestess: Guardians of The Watchtowers of The South, The Lords of Fire, we thank you for attending our Rite, as you department to your realm, we bid you farewell (as the Couple extinguishes the Red Candle together). Couple: We thank the Gods and Goddesses who have blessed this Rite and honor Them as They depart by keeping this night sacred as we depart this circle (as the Couple extinguishes the Black Candle together). High Priestess: This circle is now closed but it is forever unbroken. Merry meet, merry part and merry meet again. This Rite of Handfasting is now concluded. As above, so below. Blessed be!